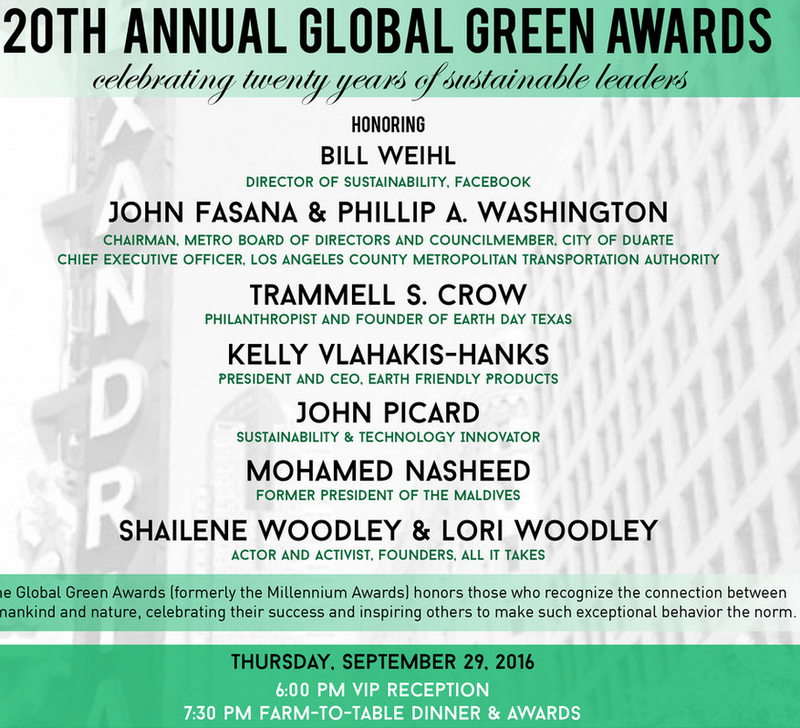 The 20th Global Green Awards will take place on September 29th, 2016 in Downtown Los Angeles at the Alexandria Ballrooms on 5th and Spring. Start time of event is 6pm.Theme and dress is black and white cocktail/business attire. The evening is an intimate vegan gourmet dinner and awards. Chef Akasha Richmond from AR Cucina will be catering the zero waste event. 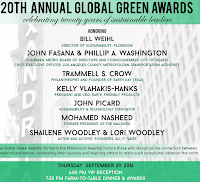 The Global Green Awards (formerly known as the Millennium Awards) recognize the tremendous achievements – and the value shift or transformation – of individuals, organizations and corporations whose leadership embodies our global founder President Gorbachev’s call to reconnect humanity to the environment. Archbishop Desmond Tutu, Ray Anderson, CEO of Interface, NRG Energy, Turner Corporation, James Cameron and Suzy Amis Cameron, Leonardo DiCaprio, Mark Ruffalo, Jeff Skoll, Wallis Annenberg and the Annenberg Foundation, former SF Mayor Gavin Newsom, Van Jones, Zac Goldsmith, Richard N. Goldman and many others. Global Green is dedicated to helping the people, the places, and the planet in need through catalytic projects, transformative policy, and cutting-edge research. Global Green’s signature programs include greening affordable housing, schools, neighborhoods and entire cities, as well as rebuilding communities such as New Orleans and areas of New York and New Jersey which have suffered from the impacts of climate change, sea level rise, and environmental degradation. Global Green was founded by Russian President Mikhail Gorbachev and Diane Meyer-Simon in 1993 to foster a global value shift toward a sustainable and secure future.